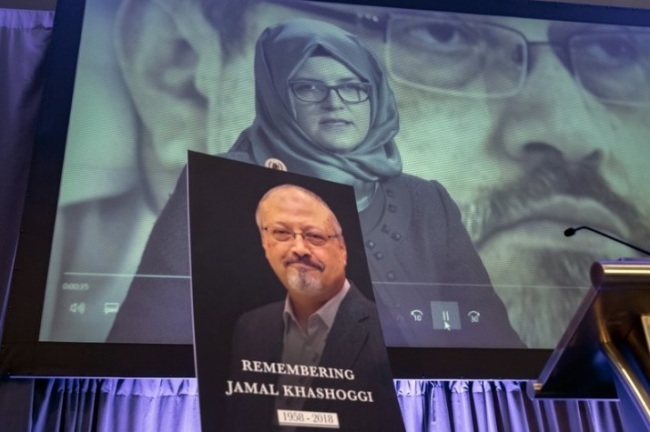 DUBAI, United Arab Emirates (AP) — Saudi Arabia will seek the death penalty against five men suspected of killing journalist Jamal Khashoggi, its top prosecutor said Thursday, while the US slapped sanctions on 17 Saudi officials in the toughest action it has taken against the kingdom since the slaying. The Saudi moves failed to appease Turkey, which has put increasing pressure on its regional rival since Khashoggi was killed in Istanbul last month, but they could be enough for some of Saudi Arabia’s Western allies to move on and press for key demands, such as an end to the war in Yemen. The prosecutor’s announcement sought to quiet the global outcry over Khashoggi’s death and distance the killers and their operation from the kingdom’s leadership, primarily Crown Prince Mohammed bin Salman. Officials and analysts say an operation of this kind could not have happened without the prince’s knowledge. Pressed by Western journalists in Riyadh on Thursday, Saudi Arabia’s top diplomat said the crown prince had “absolutely” nothing to do with the slaying of The Washington Post columnist, who was sharply critical of the heir to the throne. The Saudi investigation pointed the finger at some members of the crown prince’s inner circle but stopped short of accusing them of ordering the writer’s death. Those closest to the prince are instead accused of ordering Khashoggi’s forced return in an operation at the Saudi Consulate in Istanbul that the Saudis allege went awry. In a news conference, Sheikh Shalan al-Shalan, the deputy attorney general, said the killing was ordered by an individual whom he did not identify but said was responsible for negotiating Khashoggi’s return back to Saudi Arabia from Turkey. The individual was part of a 15-man team that was made up of negotiators, intelligence officers and logistics officials. That team was formed by Saud al-Qahtani, who was one of the crown prince’s closest aides, and former deputy intelligence chief Ahmed al-Assiri, the prosecutor said. Both men were close to the crown prince and fired from their posts after the killing. They deemed Khashoggi’s presence abroad as “a threat to national security,” the prosecutor said. Khashoggi had gone for a scheduled visit to the consulate on Oct. 2 to obtain documents for his upcoming marriage while his Turkish fiancée waited outside. This appears to contradict a previous Saudi statement quoting Turkish intelligence as saying the killing had been premeditated — one of several shifting narratives about the case that have come from the kingdom. The Saudi investigators stopped short of accusing al-Assiri or al-Qahtani of ordering Khashoggi’s killing, bolstering previous Saudi assertions it was carried out by rogue agents who overstepped their authority. The prosecutor said the agents sent in Istanbul drugged and killed the writer in the consulate before dismembering the body and giving it to an unidentified local collaborator for disposal. The body has not been found. Chief prosecutor Saud Al-Mojeb said that of the 21 people in custody, 11 have been indicted and referred to trial, adding that he would seek the death penalty against five of the suspects. It’s not unusual for a Saudi prosecutor to seek the death penalty before a trial. In Washington, the US Treasury Department announced economic sanctions on 17 Saudi officials whom it said were responsible for or complicit in the killing. Among those targeted for sanctions were al-Qahtani and Mohammed al-Otaibi, the diplomat in charge of the consulate. Also named was Maher Mutreb, who was part of the crown prince’s entourage on trips abroad. The sanctions freeze any assets the 17 may have in the US and prohibit any Americans from doing business with them. Saudi Foreign Minister Adel al-Jubeir, appearing at a news conference after the prosecutor spoke, told reporters the crown prince had nothing to do with the killing. “Sometimes mistakes happen ... sometimes people exceed their authority,” he said. Amid the international outrage over the killing, Saudi Arabia has faced increased calls from the West to end the war in Yemen, which the crown prince launched as defense minister with other Arab countries in March 2015. Simon Henderson, who has written extensively on the crown prince for The Washington Institute, said that despite the horrific killing, the West still must deal with Saudi Arabia because of its strategic position in terms of oil exports and the crucial role that plays in the stability of the world economy. “If it’s the case that MBS is still the present and the future for Saudi Arabia, which I think it is, we have to maintain a working relationship with him,” Henderson said, referring to the crown prince by his initials. Some Saudi allies appear ready to accept the narrative put forth by the kingdom in the absence of any “smoking gun” directly linking the crown prince to the murder, said H.A. Hellyer, an expert with the Atlantic Council. “It’s all about plausible deniability. If you can have plausible deniability, then I think a lot of Riyadh’s partners will go for it,” Hellyer said. The latest Saudi account, however, did little to satisfy Turkish officials, who insist the killing and its cover-up were carried out by the highest levels of government. Through a series of orchestrated leaks, including audio of the killing shared with Western intelligence, Turkey has tried to keep pressure on the crown prince. “Those who gave the order, the real perpetrators need to be revealed. This process cannot be closed down in this way,” Turkey’s Foreign Minister Mevlut Cavusoglu said.